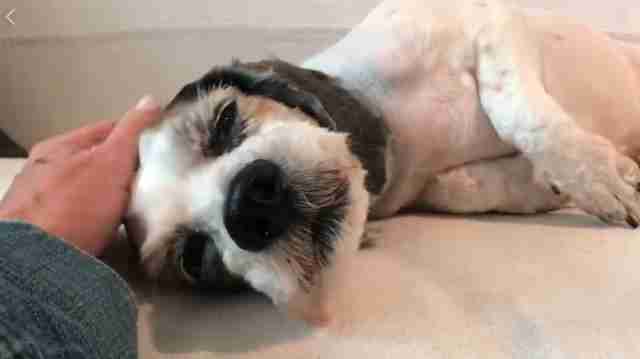 No one knows for certain what life had once been like for this poor pup named Sang Su before he was picked up from the streets of Chicago as a stray, but one thing was immediately clear — he'd gone unloved for a very, very long time. 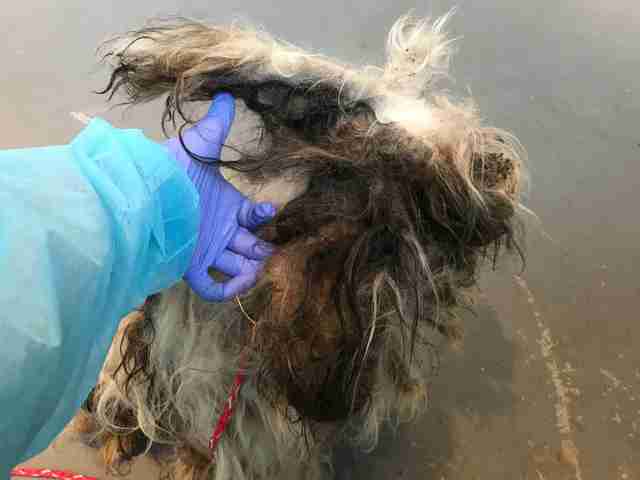 That absence of care and attention was evidenced by the thick coat of matted fur that encased him from head to tail. 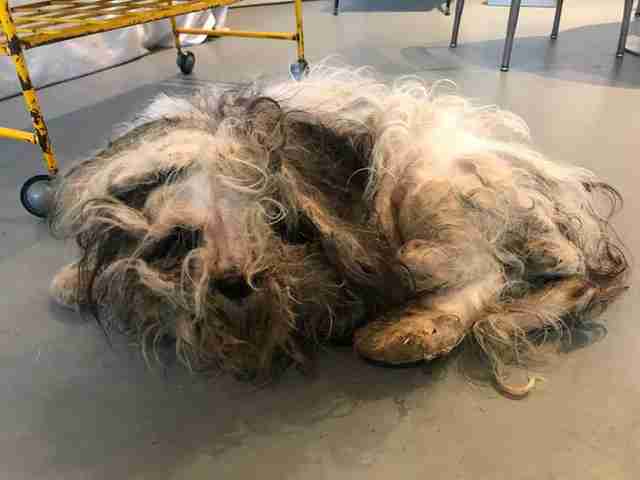 Sang Su was in such horrendous condition, his overgrown coat made him virtually amorphous; so much so, in fact, that it was impossible to even tell what type of dog lay trapped beneath. Knowing that Sang Su would require more attention than they could provide, staff at the shelter where he initially ended up called the Trio Animal Foundation for help. 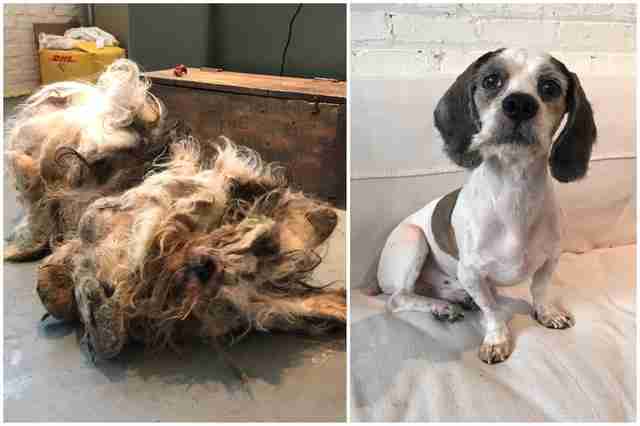 The nonprofit group specializes in caring for pets who've experienced profound neglect, but even they couldn't have anticipated the dog's awful state. "His fur was so tightly wrapped around his legs and ears that it was like a vice," Sue Naiden, president of the Trio Animal Foundation, told The Dodo. "Due to the massive amount of urine-soaked fur that encased Sang Su's body, he was hard for people to stand by because the stench from his fur burned your nose and throat." But still the dog's rescuers refused to give up on him. Sang Su was rushed in to undergo an emergency groom by medical professionals who toiled to free him from the coat that imprisoned him. "It would take four members of Sang Su's medical team, working simultaneously, two hours to cut though his matted fur," Naiden said. 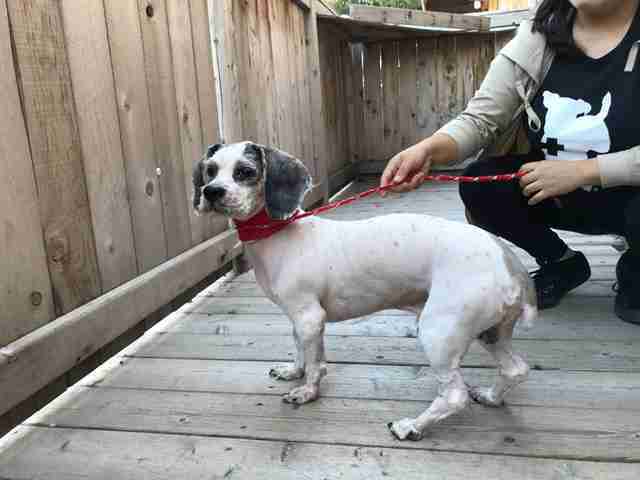 "In all, Sang Su had over 3 pounds of fur cut away from his body." And in the end, Sang Su looked like a whole new dog. Naiden had suspected that Sang Su was a Shih Tzu, poodle or Lhasa Apso mix — but now his true identity was revealed. "It was not until he came walking out from the back room that I saw he was a cocker spaniel mix," she said. 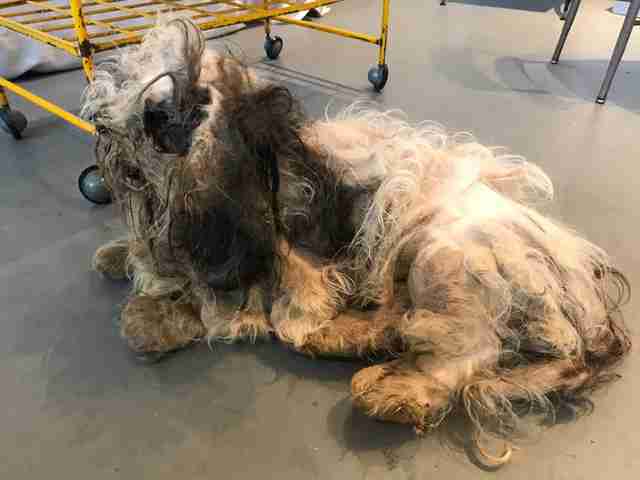 "I have been in rescue for 20 years and this was the first time that I was wrong about the breed of the dog underneath such matted fur." Sang Su's beauty could now shine through — and so too could his spirit. "Once Sang Su came out of sedation, he could finally see what was in front of him and move with full range of motion and without pain," Naiden said. "For the first time in a very long time, Sang Su could stretch his legs and run!" But there's something else Sang Su had been missing even more — the warmth of a loving touch upon his skin. Despite still seeming somewhat wary of people after the trauma he'd undergone, deep down inside he clearly longs for contact. "All he wants to do is be held or lean up against you. His legs will be shaking but he still wants you to pet him," Naiden said. "This craving of affection is what will help in his recovery and ability to trust people again." Though so much has already improved in Sang Su's life, he's not quite yet in full form. 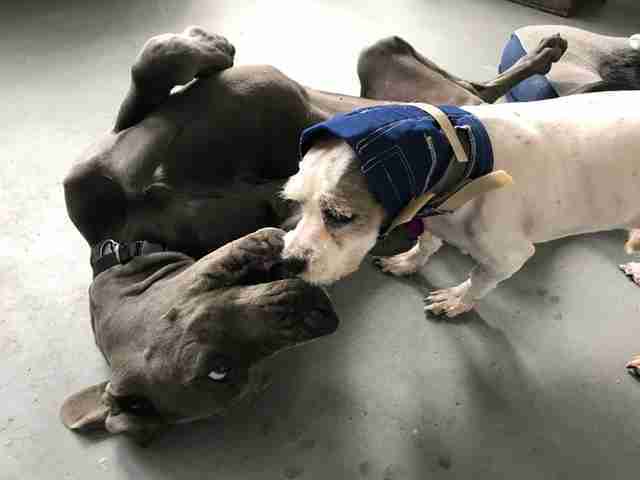 He has infections on both his ears that will require continued treatment, and is undergoing special therapy sessions with other dogs to improve his social skills. So far, things are looking up. Sang Su has certainly come a long way, but hopefully the best is yet to come. 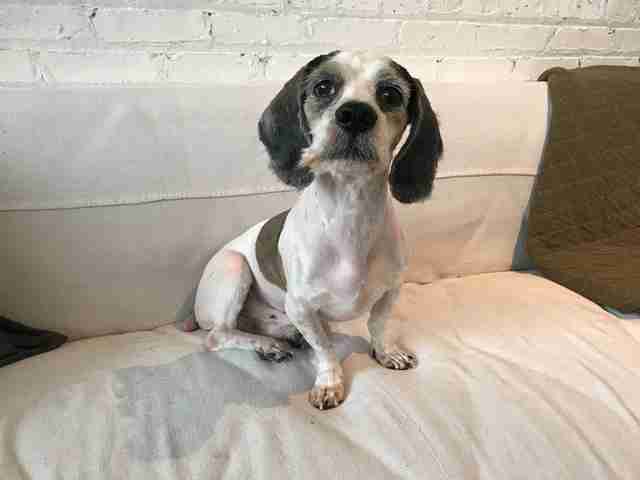 When the time is right, Sang Su will be made available for adoption from the Trio Animal Foundation — and his rescuers could use all the help they can get in covering the medical costs it'll take to get him there. 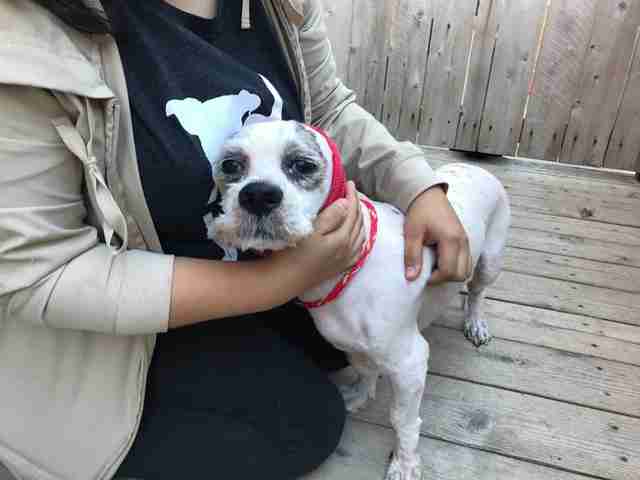 But seeing how a little dog's life can be so transformed by love makes cases like Sang Su's more than worth the effort and expense. "His story and transformation are truly amazing!" Naiden said. To learn more about Sang Su, and to find out how you can help, visit the Trio Animal Foundation's website here.